Do good things come in threes? Arguably they do. A necklace, earrings and a ring is a great combination of accessories. In folklore from around the world, faeries tend to grant three wishes. We do things on the count of three, and the third time is apparently the charm. Our Celtic ancestors were also fond of the number three. Many of the most enduring and beautiful symbols we see on Irish gifts feature a pattern based on three. The shamrock as three leaves. The Newgrange triple spiral features three swirls starting in a common center. And the trinity knot, also known as a triquetra, is three interconnected loops. The trinity knot has a distinctive shape. The loops are elongated, and their lines curve in an arch. Some suggest that the trinity knot looks like three of the stylised fish symbols used by early (and many modern) Christians. Sometimes the triquetra features a circle too, which is widely believed to represent eternity. Of course, all Celtic knots can represent eternity as the hallmark of the designs is that they have no beginning or end. The origins of the trinity knot are a bit mysterious. The Book of Kells, believed to have been created around the year 800 AD on an island off the coast of Scotland, features the design. Because of this, and because of how easily it can represent the Holy Trinity, many believe the trinity knot was created by monks. They see it as a distinctly Christian symbol, and it appears on many Celtic crosses and other religious themed Irish gifts. Who Created the Trinity Knot? But did the monks create the design or did they co-opt it? Remember Newgrange’s famous triple spiral predates Christianity by centuries. The ancient Celts did feel designs based on repeating a pattern three times were powerful. The triquetra would fit in with their known designs. But equally, the monks could have been inspired by the pre-Christian designs. One theory claims the trinity knot is not originally Celtic but Norse. The design has been found on Viking runestones in Northern Europe. And the Vikings did raid the island where the Book of Kells was created. That is what led to the book being brought to Kells in County Meath. The monks fled and joined their brothers in Ireland. 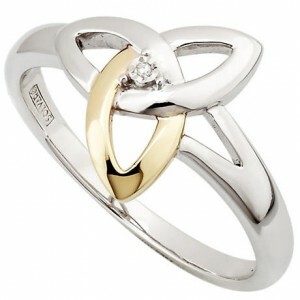 There are at least as many theories about the meaning of the triquetra knot as there are about its origins. Those who see it as a Christian symbol believe it represents the Father, Son and Holy Spirit. Those who see it as a pre-Christian motif have other ideas. It can be said to represent many things. Past, present and future. Youth, maturity and old age. Perhaps that is why it is so popular on Irish gifts. It can mean many different things to different people. But whatever it means to you, there is no denying its strong appeal through the centuries.